I couldn’t sleep last night. That’s how thrown off I was by the Cleveland Cavaliers‘ Game 1 loss. And this is strictly a fan’s perspective. I can only imagine how the Cavs felt this morning. All I know is, thanks to the brutal fashion in which they fell short in the NBA Finals opener, Sunday’s Game 2 has suddenly become a must-win. This understandably sounds like a prisoner-of-the-moment take. Cleveland has lost all but one of its series openers this postseason, yet still made it to the Finals. Comparing box scores, this was hardly as bad as the Game 1 losses to the Indiana Pacers or Boston Celtics. The Cavs had a dominant Golden State Warriors team on the brink, and almost stole a win in Oakland. On the surface, the situation doesn’t seem so dire. The fashion in which it unfolded, though, changes everything. For one, this is a Warriors team which, based on every prediction, is expected to roll through the Finals. Cleveland spent the past few days being told the odds barely favor this being a five-game series, and the assumption was the team would be lucky to lose any contest by single digits. Simply put, the Cavs weren’t expected to win any game this series. That they came so close, that they had a chance to steal a victory right out of the gate and just fumbled it, could easily come back to haunt them. However, it was the way they went about losing which makes Game 2 more make-or-break than usual. 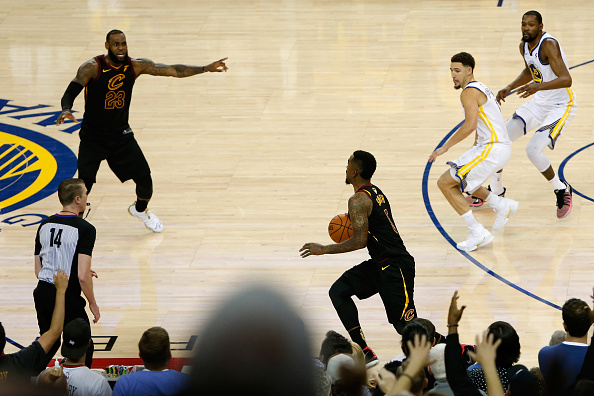 In the span of four seconds, Cleveland went from stunning the Warriors with an out-of-nowhere victory to watching J.R. Smith dribble it all away. The Cavs’ shooting guard rebounded George Hill‘s missed free throw and inexplicably decided to run out the clock in a tie game. Though the contest went to overtime, did anyone really think Cleveland was going to win? What Smith’s blunder did was spoon-feed the Warriors a victory you could argue they didn’t deserve. It wasted a 51-point effort from LeBron James. It rendered a surprisingly strong team-wide effort from the Cavs irrelevant. What Smith’s brain-fart also does is create an extra element of doubt, one which is only going to fester if Cleveland loses on Sunday. Sure, the Cavs are fresh off a series in which they rebounded from two sloppy losses to even things up at home. Despite getting thoroughly out-played in Boston, Cleveland looked undeterred on its home court, eventually taking the series in seven games. In this situation, should Cleveland return home down 0-2, it’ll be left to wonder what could’ve been. Players will be forced to consider the fact they could, and maybe even should be in a tie series with three home games on the docket, if it weren’t for one epic bonehead move from Smith. Such doubt may even creep into players’ minds in Game 2. If the Warriors start running away with it, will the Cavs be able to focus on bouncing back? Or will they instead go with what’s only human nature, wondering how much easier it would be to deal with had Smith not lost track of the score in Game 1? Make no mistake – rebounding from such a crushing defeat will be incredibly difficult for the Cavs. Should they follow it up with another loss, said task will only get harder. To be fair, the series won’t end on Sunday. For all we know, the Cavs could respond to a Game 2 loss the same way they did last round, by winning the next two contests. At the same time, they know that, to win a championship, they have to win at least one game at Golden State. Against a monster of a team. At an arena in which said team almost never loses. Cleveland had a chance to pull off such a near-impossible task right from the get-go, only to blow it. As a result, a Game 2 loss could have a much larger impact than you’d initially think. And it’s why the Cavs can ill-afford to come back home in an 0-2 hole.